Between April 3rd and 16th 2011 Dave and Australian bucketlister Sebastian Terry pedalled a tandem bicycle from Vancouver, British Colombia, to Las Vegas, Nevada. 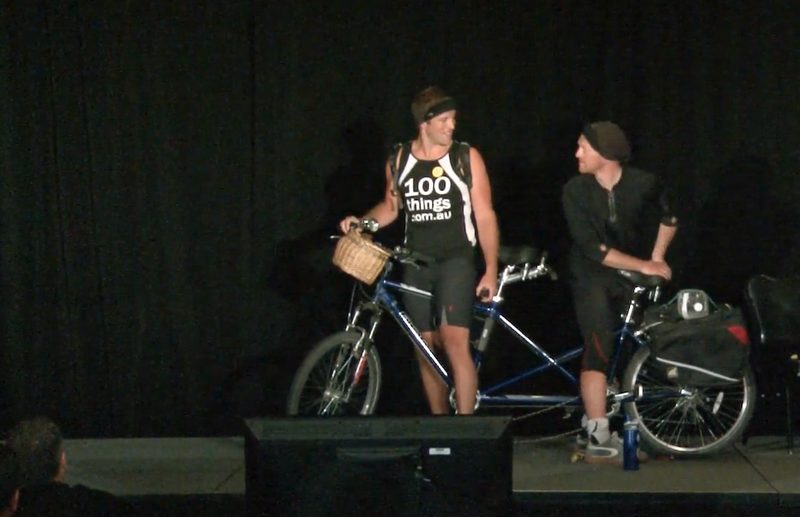 The first time Seb and Dave rode a tandem bike was in Vancouver, when they started their journey. They weren't experienced cyclists, at any rate, so this was always going to be quite a challenge. Cycling through five States, over mountains, along highways, across plains and through deserts, it's hard to believe the 1396 mile journey only lasted 14 days. In early 2010 a strange Australian man named Seb turned up on the doorstep of Dave's house in London, carrying a bag of eggs. Seb wanted Dave to help him break a world record and the very next day Seb claimed the honour of breaking the most amount of eggs (24) in 30 seconds. Tinkerbella the Tandem Bicycle was sourced and scrubbed up by Recklessin Vancouver, BC. A cheap, heavy but ultimately lovely tandem, she was very pretty with her wicker basket and clown horn.